Meet the successor GPRS-T6 ! The versatile GPRS-T6 communication unit is designed for GPRS and SMS monitoring from any alarm control panel or other device. 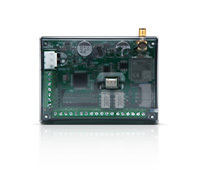 An additional functionality of the GPRS-T6 unit is the remote control of the module's outputs, which allow for e.g. activation or deactivation of the alarm system stand-by mode using SMS. The built-in buffer power supply in the GPRS-T6 module allows continued communication even if the main power supply fails.